When I was in junior high, the public pool was our regular hangout in summer. My friends and I would spend hot afternoons basking on the lawn chairs, telling dirty jokes, eating junk food from the snack bar and ineptly failing to flirt with girls. Sometimes, we’d even go into the water. Now that I’m an adult, I’m stuck at work year around. A window pane and half a lifetime separates me from those idle summer days. But as I reflect on those days long gone, I realize that both work and the pool have one thing in common – rules. And in looking at the list of the pool rules posted on the locker room wall all those years ago, I find that only a few minor changes are needed to apply them to work. 1) Please obey all lifeguard supervisor instructions; failure to do so may result in being asked to leave. Do what you are told or we will fire you. 2) Proper swim work attire is required. 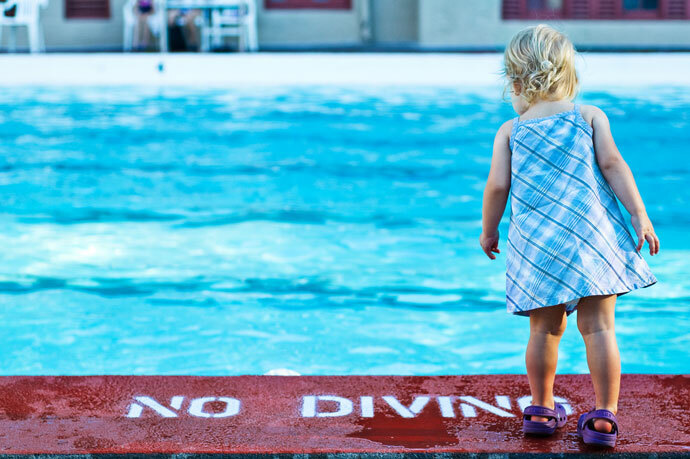 No street clothes, cut offs, denim shorts, or thong bathing suits are permitted in the pool work area, unless deemed appropriate for religious purposes. Dress appropriately. I am unsure which religion requires thong bathing suits, but regardless, they or any of the other items described, are not appropriate at the pool or work. 3) Only service animals permitted in Aquatic Facility, all other pets are not allowed. Animals do not belong in most workplaces. Sure, there are a few start-ups that allow you to bring your dog to work, but they’re the exception. As much as I love my mutts, and would like to have them at my feet while I work, I realize that other people might be allergic, dogs can be disruptive, and some of my coworkers are just plain scared of dogs. Besides, while my dogs are well-behaved, I wouldn’t want them at work if it meant I had to put up with your nippy little chihuahua or the incessant yapping of you Tasmanian devil of a terrier. 4) Food and drink are not allowed in the aquatic facility workplace. Research shows that not eating is not only desk neater and more professional, getting away from work for lunch makes you healthier and more productive by giving you a break from the daily grind. Yes, in some workplaces running might be necessary, but in most offices, it’s just a worker’s comp case waiting to happen. 6) No pushing, shoving, horseplay, or inappropriate behavior is allowed. I actually worked for a company that specifically stated “no horseplay” in their handbook. Ever seen horses play? They rear, they kick, they bite. This sort of activity is not acceptable in or out of work. And unless you work as a mosh pit coordinator, pushing and shoving is never okay. 7) No diving into the shallow end of the pool. Backward dives and flips are not allowed. Too often at work, we jump in head first without knowing where we’re getting into. Ever go into a meeting unprepared? Act on an assumption only to find out that assumption was wrong? Head in one direction on a project then have to change direction? I’m sure you have, and if so, you were risking the workplace version of a broken neck. 8) Individuals who cannot swim are only allowed in the shallow end. If you don’t know what you’re doing and start doing it anyway, you’ll end up splashing around in the deep end, and someone else will have to come save you. 9) Gum must be deposited in the trash cans before entering the water work. Whenever I’m talking to a coworker who is munching on a wad of gum, I can’t help but feel like I’m speaking with a nine-year-old. 10) All swimmers workers having a communicable disease or displaying signs and symptoms of a communicable disease which can be transmitted through normal swimming pool use shall be excluded. If you’re sick, stay home. You might think you’re doing the right thing by dutifully showing up at work, but all your accomplishing is giving your coworkers whatever you have. 11) Glass, sharp objects, or any other items which might cause injury or accidents shall not be allowed in the pool or pool area at work. This is just common sense, although I do have a letter open which could cause a nasty cut if wielded improperly. 12) Spitting, spouting water, blowing your nose, or discharging bodily waste in the pool at work is strictly prohibited. 13) All persons using the swimming pool work must take a shower before entering the pool enclosure. Don’t be that smelly guy with the greasy hair that no one wants to sit next to in the lunch room. 14) Glass containers are not allowed in the Aquatic Facility or on the outside patio at work. Okay – this one doesn’t fit in the workplace. I guess they’re afraid that something might break, and it would be hell to get shards of glass out of the water. I’ve had the same coffee mug for 15 years, and have yet to crack it. One last similarity between pool and work rules – I often try to break them. I took great pride in trying to sneak past the lifeguard without showering, or splashing my friends when no one was looking. I spent a lot of time sitting on the hard concrete instead of being with my buddies as punishment. Today, I still eat at my desk, and dive into work I am not clear on how to do, preferring to learn along the way. No horseplay, though, that’s where I draw the line.